Money pinching. 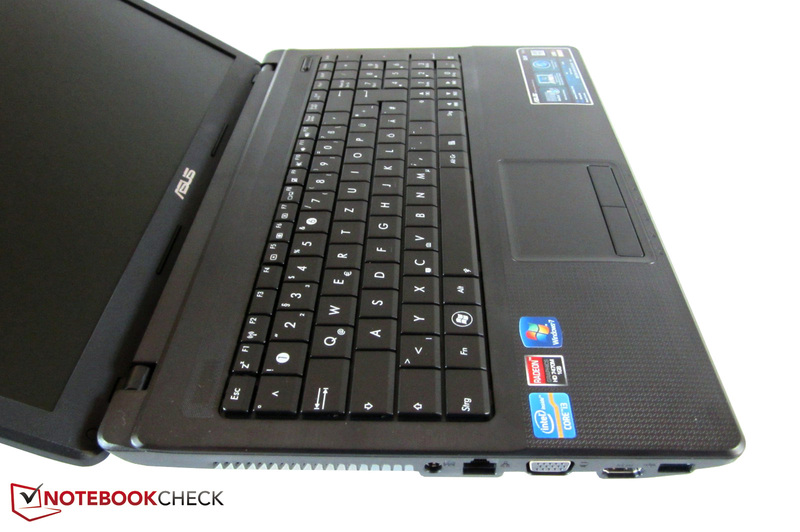 Asus primarily focuses on the price in the X54HR-SO060V. Great equipment or high performance isn't possible for just under EUR 480. 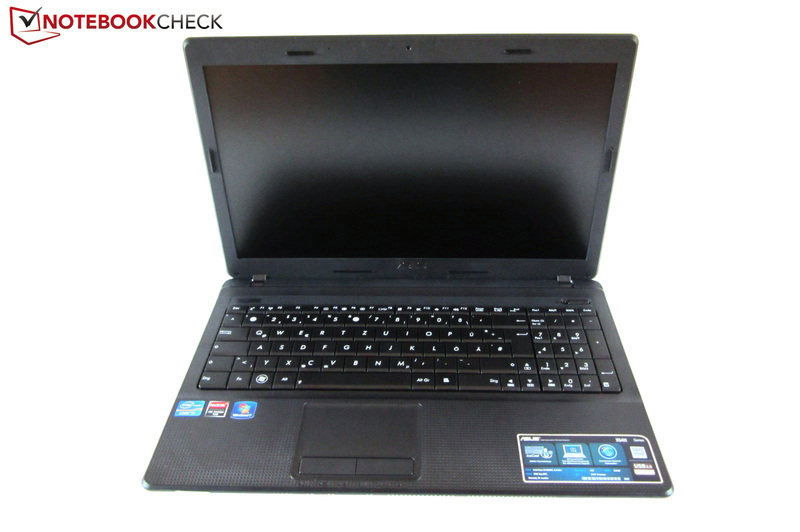 Is the 15 inch multimedia notebook, equipped with AMD's newest Radeon HD 7470M, nevertheless a good alternative for smart savers? 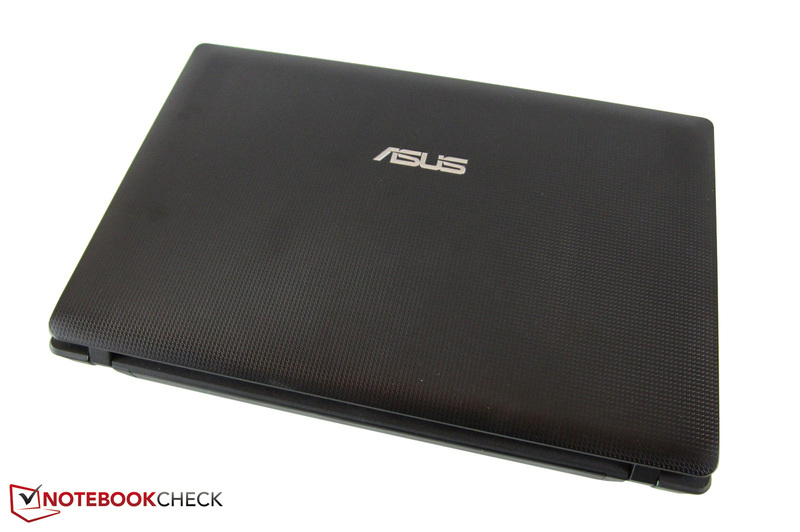 With the X54HR-SO060V Asus debuts a simple all-rounder that makes a rather unimposing impression both optically and technically. Components from either the entry level or midrange are installed. For example, the Core i3-2350M from Intel, which is an state-of-the-art dual core CPU with a clock of 2.3 GHz. In the meantime, AMD's brand new (at least according to the name) Radeon HD 7470M does its job as the graphics card. 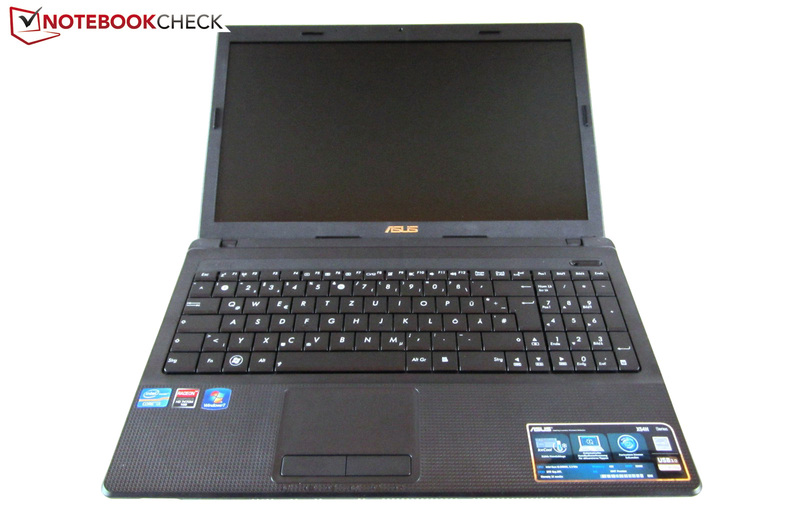 Four GB of DDR3 RAM, a 320 GB HDD and a CD/DVD burner are other features of the configuration. Apart from its matt surface, the 15.6 inch screen (1366 x 768) offers no surprises. 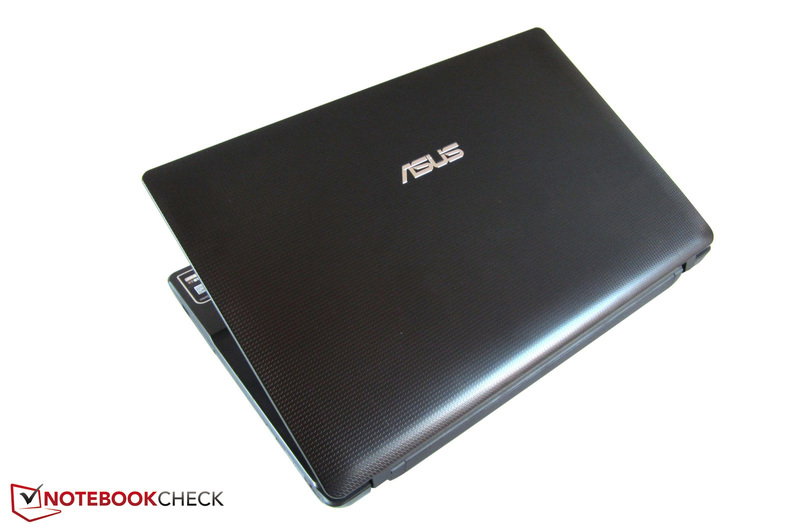 Asus also sticks to the standards in terms of the operating system (Windows 7 Home Premium 64bit). The assessment of all vital categories now follows in our review. 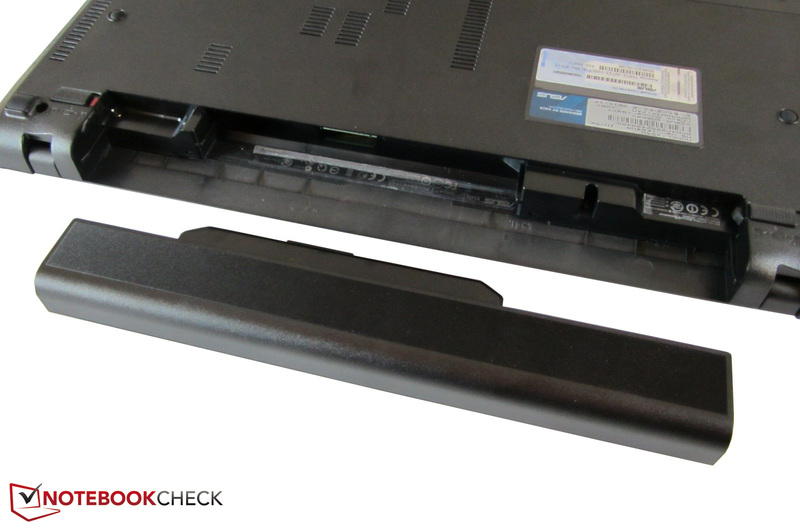 In contrast to the X53SK or K53SK (metal wrist rests), the case of the X54HR is made completely of plastic. 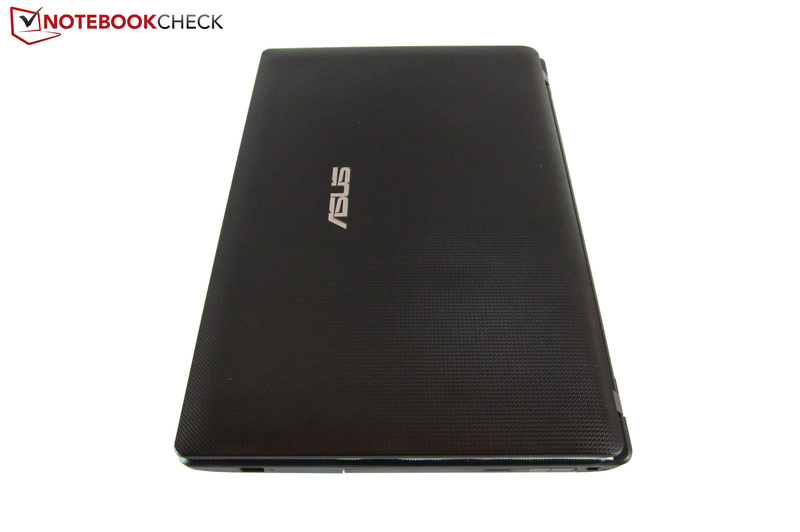 To pep up the dull appearance a bit, Asus gives the black surfaces a subtle texture. Although it is nice to look at, it can't belie the relatively poor quality. The materials have a somewhat cheap feel to them when taking a closer look; small details, such as the "fake" speaker grid and the "cracking" battery area cause further losses in sympathy points. On the other hand, the stability is good - with exception of the yielding keyboard and the not particularly twist-resistant lid. The workmanship doesn't give reason for complaint, either. 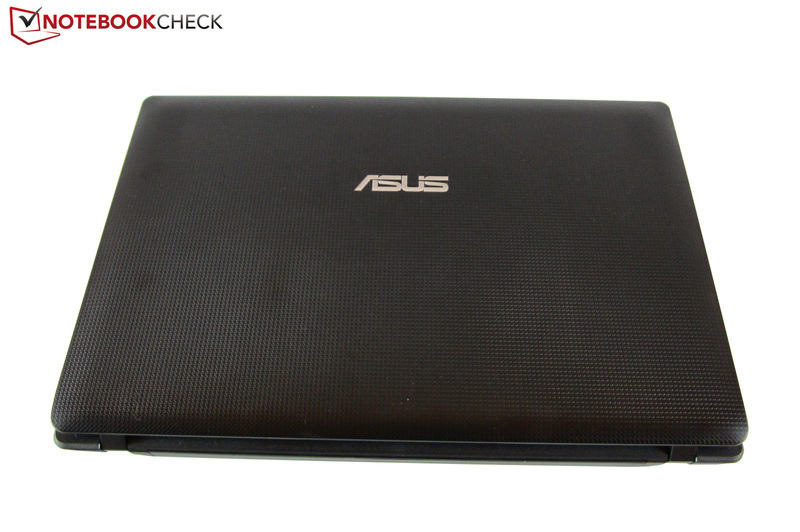 Since Asus doesn't use a high-gloss finish, the surfaces are fairly resistant. Fingerprints don't prevail even after longer use and the device doesn't need polishing very often. The tightly pulled hinges, which cause an evident lifting of the base unit, keep the display in its position quite well during vibrations. Thanks to the moderate weight (~2.4 kilograms) and the compact 75 watt power adapter, a frequent transport of the device doesn't turn into agony. The connectivity isn't as generous as in the almost identical K53TA-SX026V. 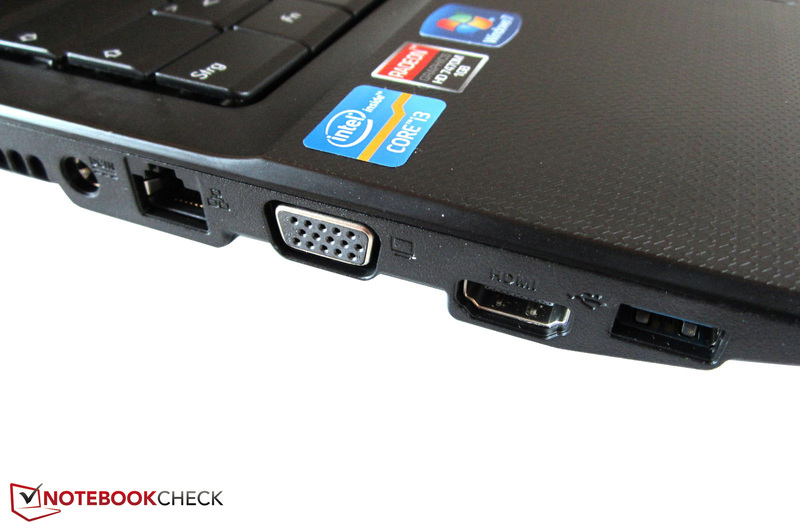 The X54HR only has scanty 2 USB ports (1 is USB 3.0) rather than three USB ports. You can almost count the other interfaces on one hand: RJ45 Gigabit LAN, VGA, HDMI, card reader, Kensington lock, microphone and headphone jack - more would have been possible here. The interface positioning couldn't convince us either. The elbowroom at the sides could suffer because of the front-heavy positioning, depending on the connected cables. The popular Atheros AR9285 Wireless Network Adapter is installed as the wifi module. Although Bluetooth isn't available, all important wifi standards are supported (2.4 GHz). The maintenance cover on the case's bottom is easy to remove. 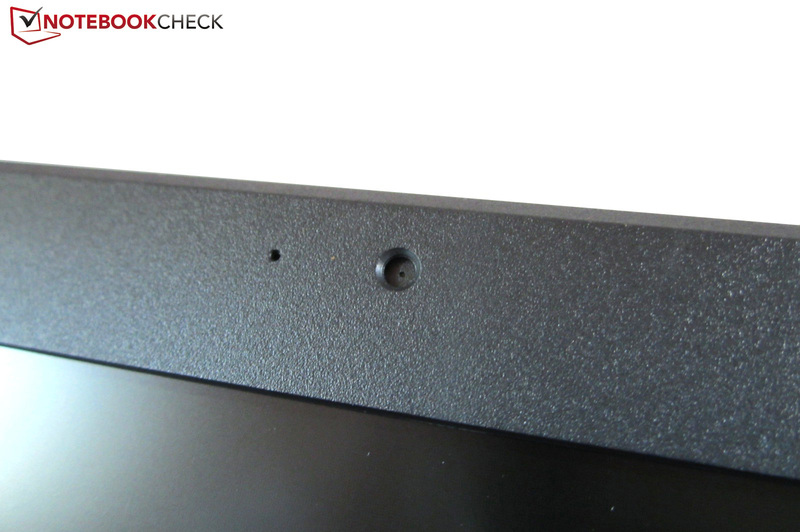 After both screws are removed, the cover can be pulled toward the front without much effort. However, it's not possible to access more than the working memory (only 1 slot! ), the hard disk and the wifi module - too bad. 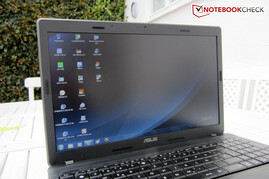 As so often, Asus loads the notebook with a lot of adware, programs, games and drivers. There are over 60 different items in the Windows uninstall routine in its state of delivery (see picture). Eleven programs are from the manufacturer itself. Many readers will now likely think that free software sounds like an absolutely great thing. We definitely don't see it that way because the longer boot times and the annoying popup windows are soon noticed in practical use. When the notebook, the power adapter and the battery have been unpacked, there is almost gaping emptiness inside the box. Recovery or driver DVDs are non-existent. Only a short manual and a warranty card are found. Most competitors make cutbacks here as well. The warranty usually amounts to 24 months (pick-up & return service). However, if you take advantage of the optional extension packages, you can hope for three years of repair. The unlit keyboard only appealed to us to an extent. While the pressure point and stop are sufficiently defined, the typing noise makes a cheap and clattery impression. 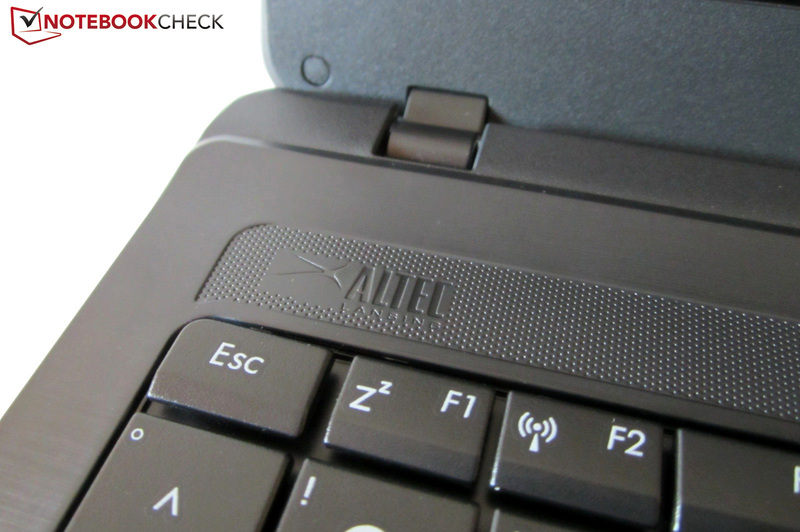 Comfortable working is possible thanks to the good key size (17 x 17 millimeters) despite the small gaps. The buyer neither has to live without a dedicated number pad nor practical special functions that are, as usual, controlled via the FN key. The big lettering and clear symbol language are more advantages. The manufacturer also does (almost) everything right with the layout - only the combined ins/del keys annoyed us. 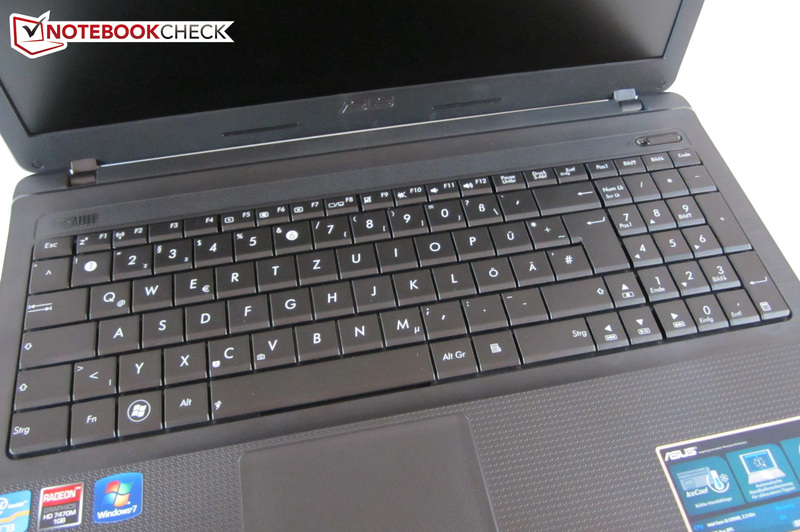 The touchpad, which can be disabled, also secures itself the rating "good". Among other things, we have the great feedback on the pro side. 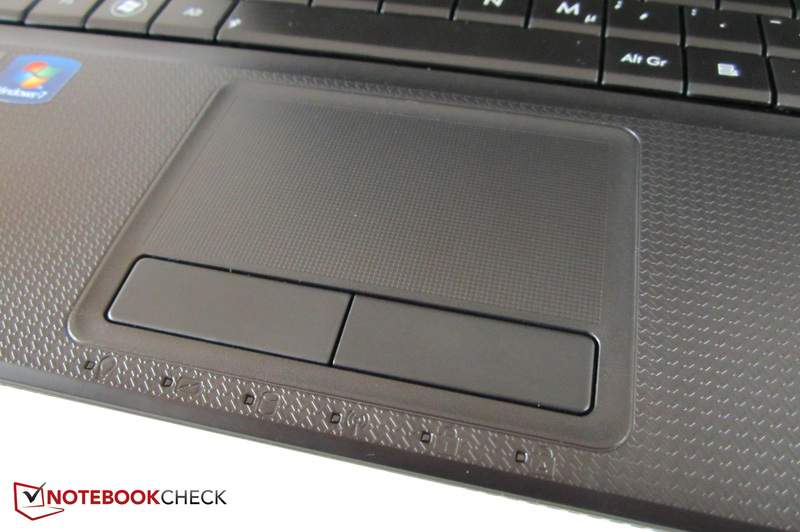 Its slight lowering and the surface, covered with tiny dots, ensure a clear feedback (the touchpad of the K53TA-SX026V was still smooth). In return, losses in the gliding quality have to be accepted. The rough surface slows down the fingers noticeably. The well-conceived multi-touch support however quickly compensates for this drawback. Elements can not only be scrolled horizontally and vertically using two fingers, but also rotated and zoomed. 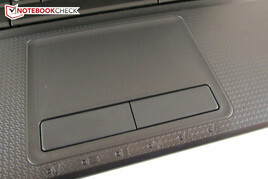 We didn't notice any inaccuracies; the touchpad usually worked without flaw. The size of 82 x 45 millimeters will likely be sufficient for most buyers. However, it would be nice if Asus would alleviate the extremely loud mouse keys. 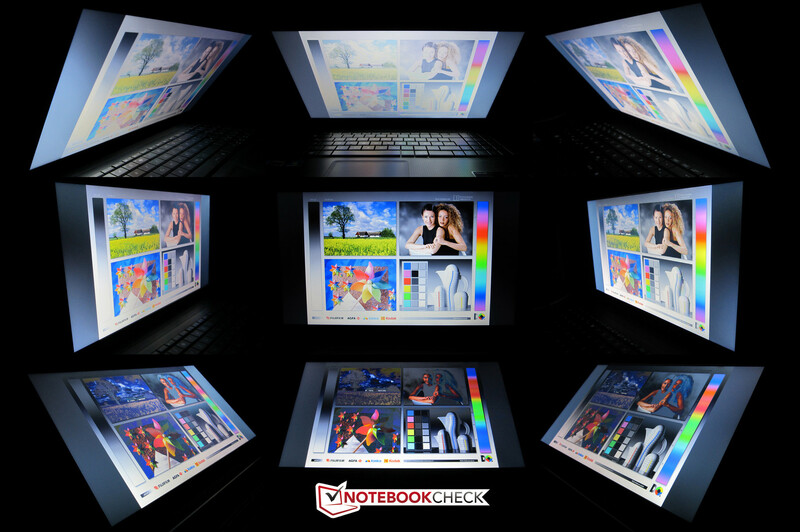 Normally, multimedia laptops are equipped with a shiny "mirroring" screen. The X54R is one of the few exceptions. 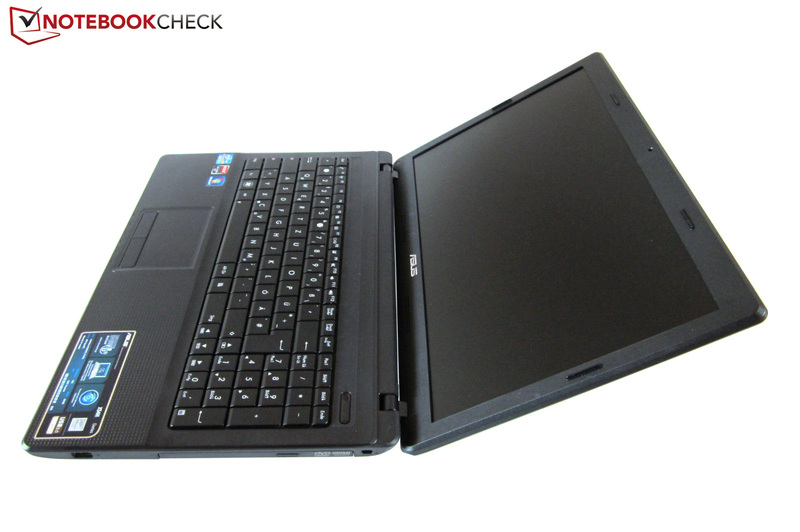 The manufacturer builds in a matt 15 inch screen that has an aspect ratio of 16:9 and a LED backlight. While the LG Philips screen (LP156WH4-TLB1) easily suffices for Office and Internet applications, various shortcomings become apparent in movies and games. Especially the high black value tends to ruin the fun occasionally. 1.8 cd/m2 are far higher than the notebook average of approximately 1.0 cd/m2. Compared to a good screen, black content is rendered extremely grayish. On the other hand, the contrast of nearly 100:1 is far too low. The image can't be called vivid and saturated. If you want to do professional photo and/or video editing, you'll have to take a different device anyway. The reason: the color spectrum is very limited. The brightness isn't exciting either. Although more than 186 cd/m2 are rarely needed indoors, you'll often find yourself wanting a higher luminosity outdoors very often. However, the image looks quite homogeneous despite the fact that our measurements show a poor illumination. But regardless of the moderate brightness, the surface is a lot less reflective than a typical glare model. It is possible to work outdoors well with the notebook when it's not too sunny. 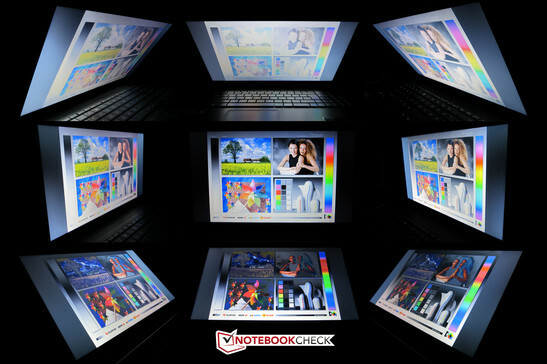 A basic rule: If you want to use the notebook mainly for Office applications and Internet accessing, you should avoid glossy screens. The viewing angles are extremely narrow particularly on the vertical plane. As soon as you deviate even marginally from the ideal position, the image is rendered incorrectly. The horizontal viewing angles aren't a hit either. Verdict: the built-in screen will only suffice undemanding buyers. 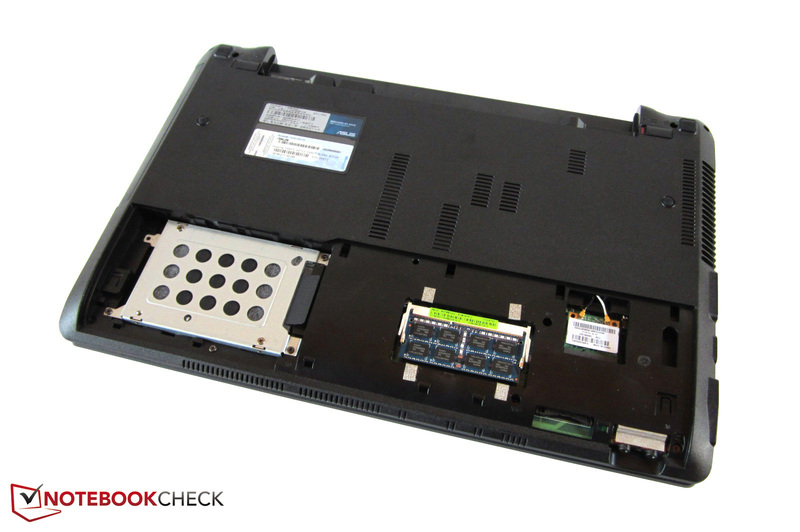 The X54HR is miles away from the image quality of a HP ProBook 6560b or Schenker XMG A501. Intel's Core i3-2350M is slowly but surely becoming the standard CPU for low-priced Office and multimedia laptops. The dual core, based on the Sandy Bridge architecture, runs with 2.3 GHz and can process up to four threads at the same time thanks to the Hyper Threading technology. In contrast to the more expensive Core i5 and Core i7 models, the processor unfortunately doesn't support automatic overclocking (Turbo Boost). Nevertheless, the dual core is more than fast enough for everyday tasks. This is not least due to the 624 million transistors and the 3 MB L3 cache. By the way, the integrated HD Graphics 3000 is not available in the X54HR because Asus has saved on a graphics switching. Alike its family members, the Core i3-2350M is manufactured in a 32 nm process. In terms of performance, the 35 watt CPU is positioned in the lower midfield. The results of the CPU benchmarks absolutely meet the expectations. With 3756 points, the 15 incher processes just as fast as the Aspire 5750G-2354G50Mnkk, also equipped with a Core i3-2350M, in the single core rendering of Cinebench R10. Multi core rendering doesn't reveal any nasty surprises either: 8288 points are just minimally below that of the just mentioned Acer notebook (8303 points). All in all, we deem the Core i3-2350M to be a well-designed and fair-priced all-round CPU. It has unfortunately become customary that both big GPU manufacturers, AMD and Nvidia, simply modify or improve their old models very slightly (if at all), only to throw them onto the market as an allegedly fresh generation. The same is true for the Radeon HD 7470M. Like its precursor HD 6490M, the entry level graphics card is based on the Seymour chip (40 nm) and only has 160 shader units. To make things worse, it's not the normal, but rather a slimmed down version that does its job in the X54HR. Thus, the 512 MB DDR3 video memory (64bit interface) only clocks with 667 rather than 800 MHz. At least the core clock of 800 MHz is on the expected level. Nevertheless, the graphics card has a major loss in performance due to the low memory clock. Depending on the benchmark, the low-end model is even surpassed by the Radeon HD 6470M. The video decoder, with the name UVD3 (accelerates HD videos), and the HD audio controller (surround sound via HDMI) are only a minor comfort here. We used the pre-installed GPU driver version 8.901.0.0 (Catalyst 11.10). The graphics performance won't likely impress anyone anymore in 2012. While midrange models, such as the GeForce GT 630M, present a GPU score of 800 - 1000 points in 3DMark 11 (1280 x 720), the Radeon HD 7470M only manages 498 points. 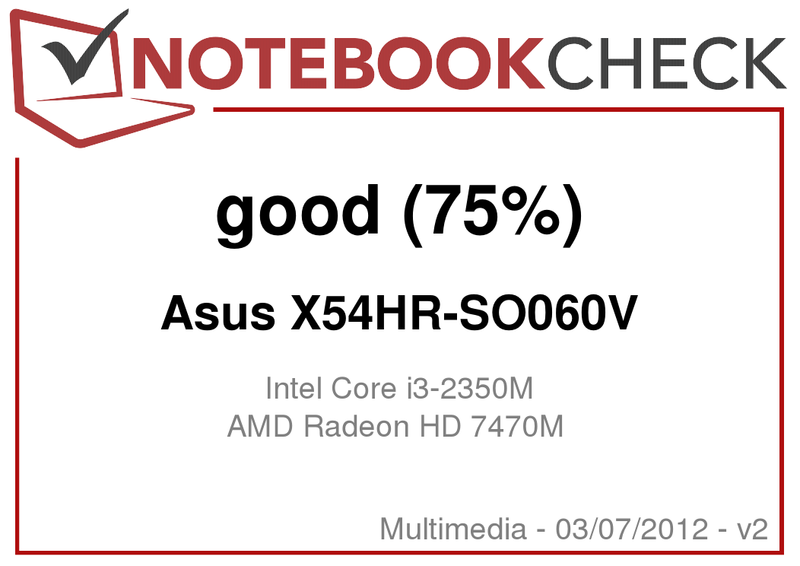 Thus, the graphics card is slightly above that of a slimmed down GeForce 610M (459 points @ Acer Aspire 5750G-2354G50Mnkk), but considerably below that of a normal Radeon HD 6490M (601 points @ Samsung 700Z3A-S03DE). It looks even worse for the HD 7470M in the Unigine Heaven benchmark (1280 x 1024). With 5.4 fps, the GPU calculates almost 20% slower than the Radeon HD 6490M (6.7 fps) and 25% slower than the GeForce 610M (7.2 fps). We don't understand why Asus buys such a lame version of the HD 7470M. This decision can't really be due to the cooling (see Temperatures below). Could it be that the cost factor plays a big role? 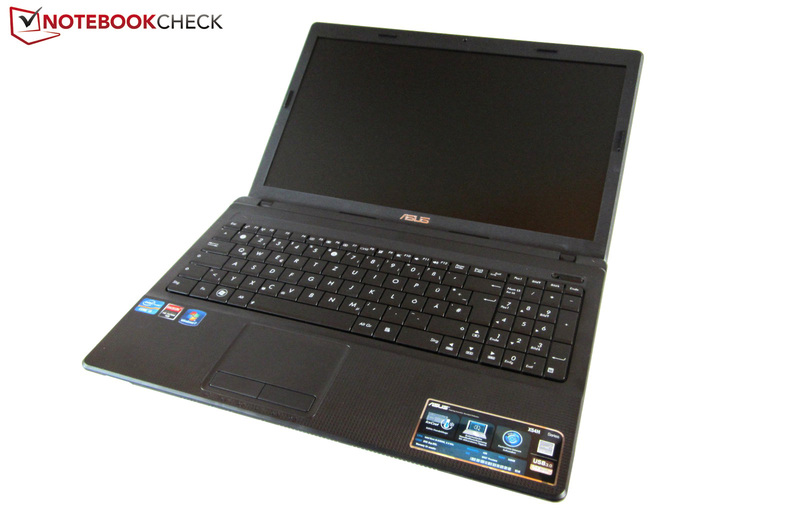 The manufacturers consider every euro, particularly in entry level notebooks. The buyer only gets the standard fare in view of the hard disk. The 320 GB and 5400 rpm WD3200BPVT-80JJ5T0 from Western Digital doesn't even come close to a 7200 rpm model (see e. g. the HP Envy 14-2090eo). According to the tool, HDTune, the average transfer rate is only 64 MB/s. The access speed of 23.5 ms is just as moderate. If you get annoyed by long booting and waiting times, you should consider installing a solid state drive. Regardless of that, Asus divides the HDD into two similarly sized partitions (119 & 153 GB). 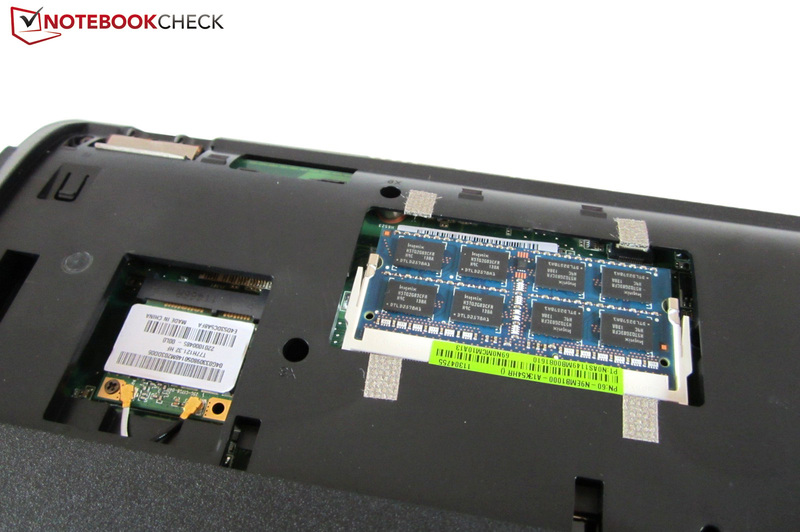 The system performance doesn't need to hide behind other multimedia notebooks. The X54HR does well in PCMark Vantage, which tests various scenarios from Office over video up to 3D applications. 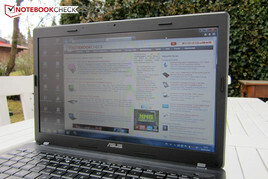 5592 points almost correspond to the result of the Acer Aspire 5750G-2354G50Mnkk (GeForce 610M). For comparison: The Asus K53SK-SX021V (Radeon HD 7610M), much faster in games, can only break away to an extent with 5908 points. 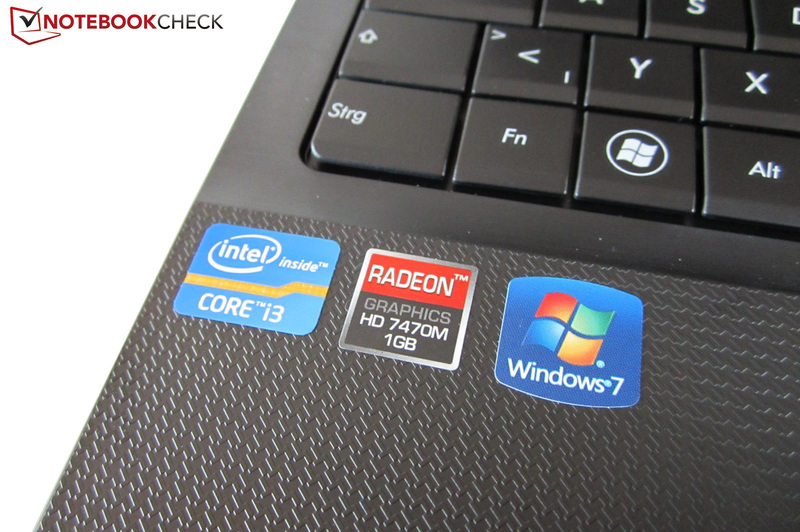 Devices with an AMD CPU don't stand a chance against Intel notebooks. 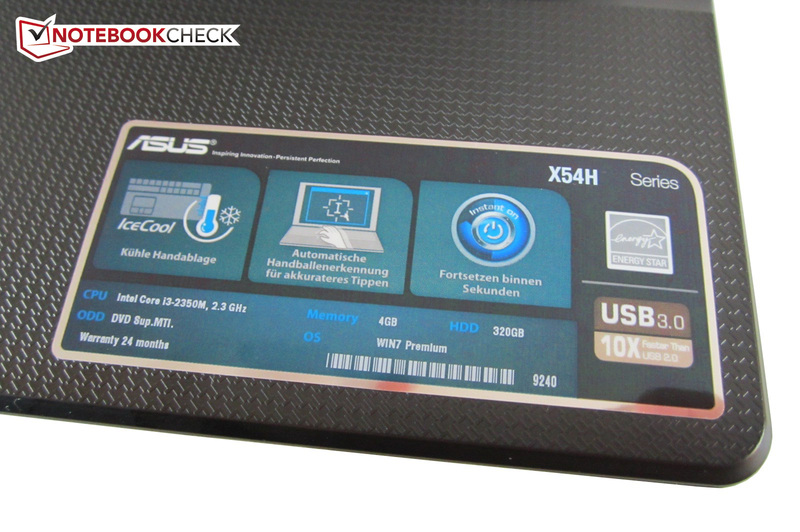 Thus, the Asus K53TA-SX026V (A6-3400 & Radeon HD 6720G2) only achieves 3808 points in PCMark Vantage. The fairly low memory clock of the Radeon HD 7470M not only has an adverse effect in the synthetic benchmarks, but also in real gaming use. As mentioned earlier, the graphics card is often surpassed by the popular Radeon HD 6470M. Principally, the HD 7470M is only suitable for new games to an extent. If you want to play the latest games, such as Skyrim or The Old Republic, you will often have to be satisfied with low or default details. Anti-aliasing is not possible in most cases. A few exceptions (e. g. Metro 2033 & Battlefield 3) aren't smoothly playable even in the lowest settings. Midrange graphics cards manage a lot more here. A GeForce GT 630M sometimes manages up-to-date games even in high details (1366 x 768). Thus, the 3D power is at most enough for undemanding casual gamers. Note: The Nvidia contender, GeForce 610M, is approximately on a par with the Radeon HD 7470M. The noise emissions prove to be average. 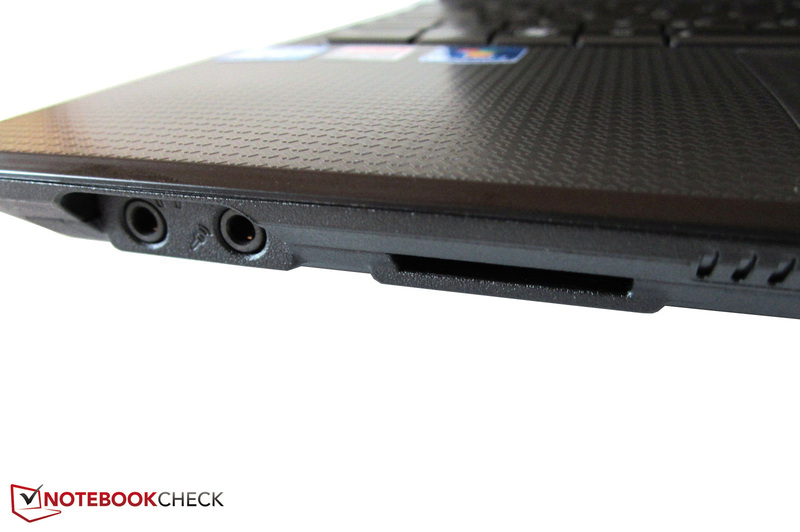 While the notebook stays fairly quiet when idling (particularly the hard disk is audible), the fan rotates at a clearly audible but not disturbing speed in 3D applications. 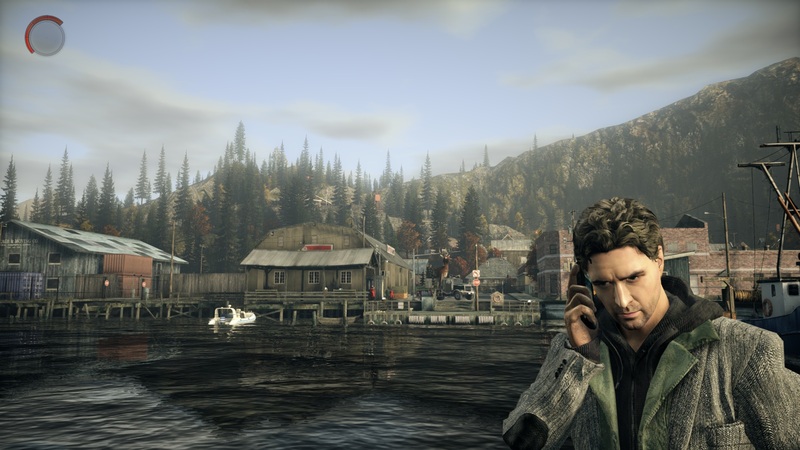 In contrast to some other notebooks, the soundscape in games isn't permanently drowned out. The DVD burner's noise level is also acceptable. The only thing that could be improved is the fan noise as it occasionally makes a quite high-pitched impression. But most users will be satisfied with the emissions. Now we will take a look at the temperatures. The case surfaces don't get disagreeably warm in either idle mode (~27°C) or during load (~30°C). 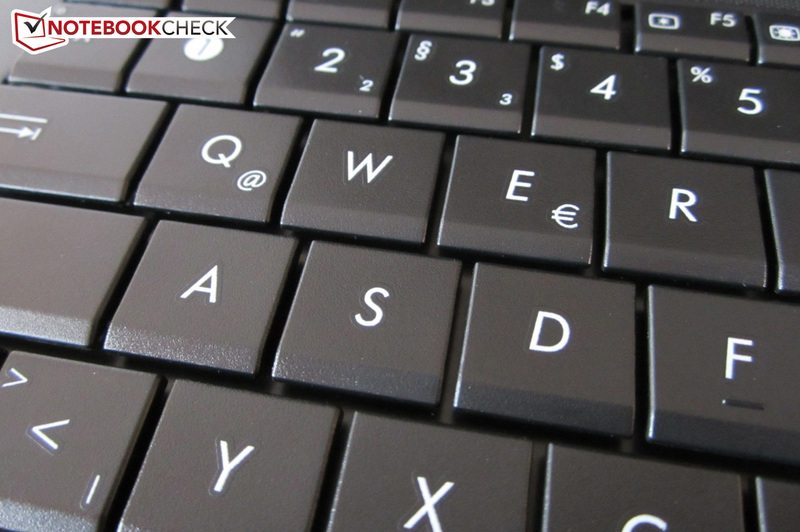 A multi-hour typing or gaming session can be easily put into practice. However, the manufacturer exaggerates a bit with its slogan "Ice Cool". Great: There's no need to fear heat-related component failures even during full load. A maximum of 80°C on the processor and up to 65°C on the graphics card point toward sufficient cooling. The notebook is spared from a temperature-related throttling (=down clocking). (+) The maximum temperature on the upper side is 32.3 °C / 90 F, compared to the average of 36.5 °C / 98 F, ranging from 21.1 to 71 °C for the class Multimedia. 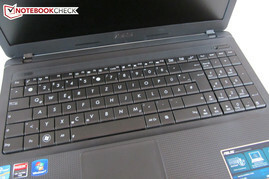 Although the speakers allegedly come from Altec Lansing and the notebook supports the Sonic Focus technology (see picture), the sound quality is only moderate. The weak bass and poor maximum volume, among other things, have to be mentioned on the con side. Beyond that, the sound makes a somewhat dull and unclean impression. External speakers or headphones should definitely be connected so that games, movies and music tracks can really come into their own. 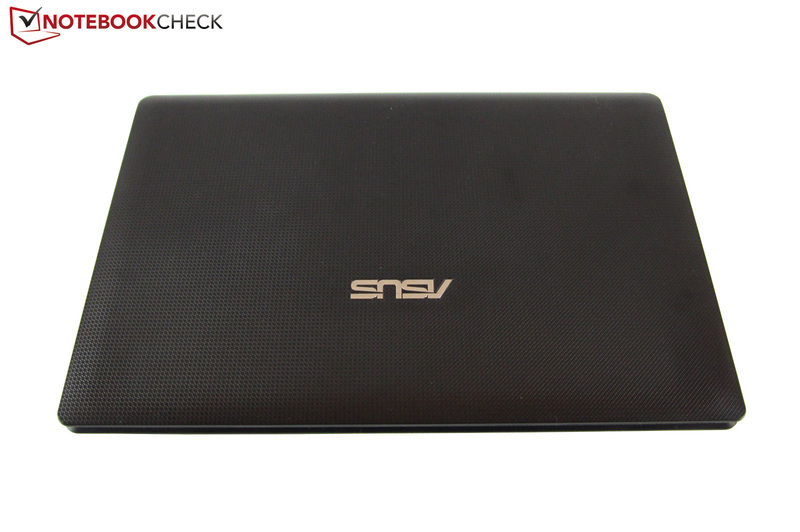 Asus proves that the sound can be much better with its 15 inch N55SF and the 17 inch N75SF. The tester believes that the title of best sound still belongs to the Dell XPS 15, respectively XPS 17. The power requirement is fairly low, but could be even lower with graphics switching. Thus, the X54HR's power consumption of 12 - 16 watts is a bit higher when idling than that of comparable multimedia notebooks, which have Nvidia's Optimus technology (see e. g. the Samsung 300E5A-S01). On the other hand, the all-rounder makes a good impression during load. 46 watts in 3DMark 06 and 66 watts in the stress test are absolutely acceptable. Asus doesn't put any value on a viable battery life in the X54HR. A 4 cell model with 37Wh and 2600 mAh is rather pathetic. The notebook has to be plugged into the outlet correspondingly soon during load. Battery Eater's Classic test just only ran for 56 minutes with maximum brightness. 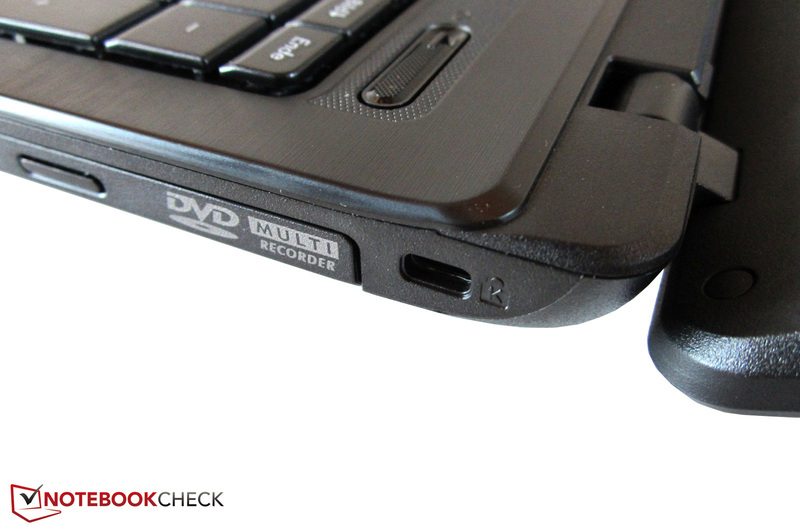 The multimedia laptop was drained just as quickly in the DVD test – just under 100 minutes won't be enough for all motion pictures. If you surf on the Internet via wifi, you can count with a runtime of approximately two hours. The notebook even only lasts for around three hours when idling on minimum brightness (Battery Eater's Reader's test). This is annoying seeing that the K53TA-SX026V, reviewed a few months ago, still had a significantly stronger battery (56 Wh, 5200 mAh). 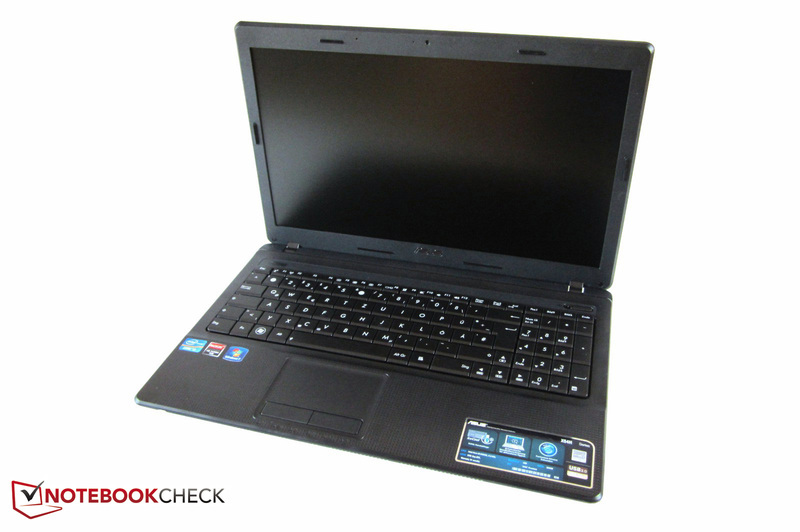 The X54HR-SO060V's low price of just under EUR 480 is noticed wherever you look. There is only one RAM slot, a weak 4 cell battery, only 2 USB ports and no graphics switching - the list of cost-cutting measures is long. The image and sound quality isn't really impressive, either. We were particularly disappointed by the viewing angle dependent and contrast poor screen. Moreover, there is the quite lame entry level graphics card and the clattery keyboard. The short battery life (approximately two hours under normal conditions) is another minus point. The 15 inch notebook of course has its strengths. In addition to the moderate temperature development and the compact power adapter, we particularly liked the insensitive and not especially heavy case. The matt surfaces hardly show smudging even after intense use. 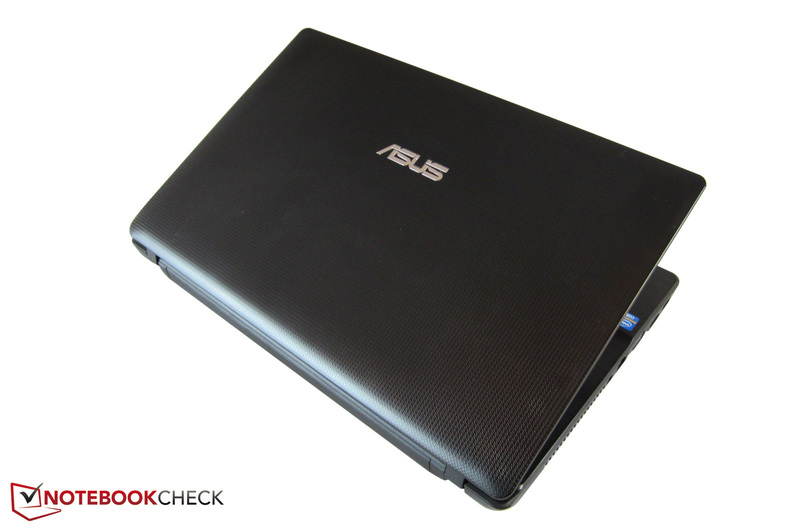 Thanks to Intel's powerful Sandy Bridge processor, the notebook has a fairly good application performance. 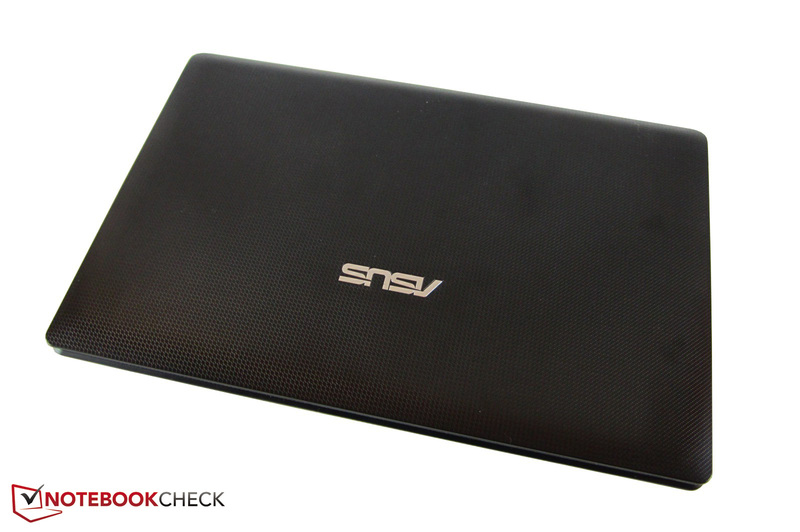 If you don't really need a matt screen, you should preferably turn to Asus' own K53SK-SX021V. Firstly, it can serve with a much faster Radeon HD 7610M for an additional EUR 100. Secondly, the notebook has a metal wrist rest. And thirdly, the battery life is a lot better. 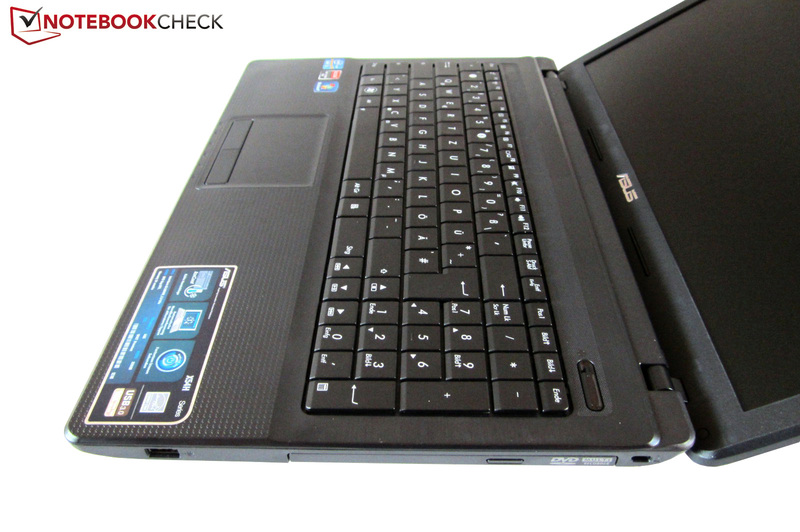 In the meantime, we would sooner recommend the Acer Aspire 5750G-2354G50Mnkk in the price range of up to EUR 500. The total package makes a more balanced impression. The 15 incher looks rather unimposing. A wifi module belongs to the must-have list. 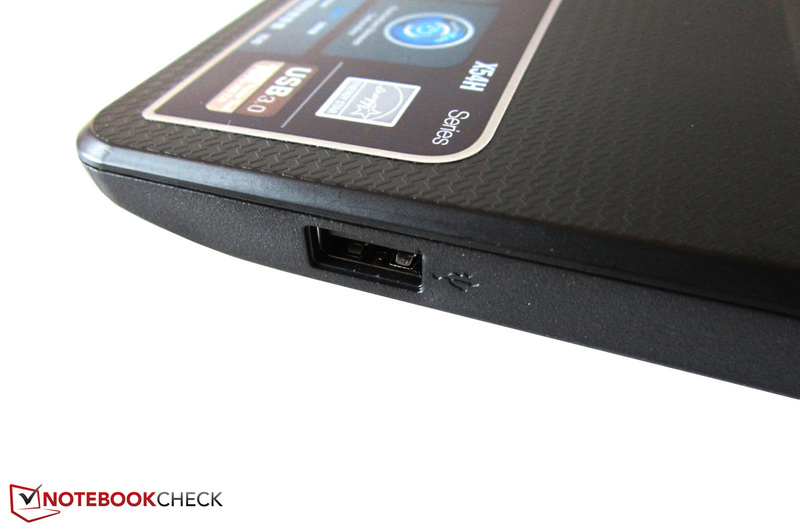 The battery is conveniently inserted into the rear. The manufacturer builds in a 0.3 megapixel webcam. We weren't happy about the clattery keyboard. The speakers' grate is only a dummy. The graphics card's performance is disappointing for the most part. 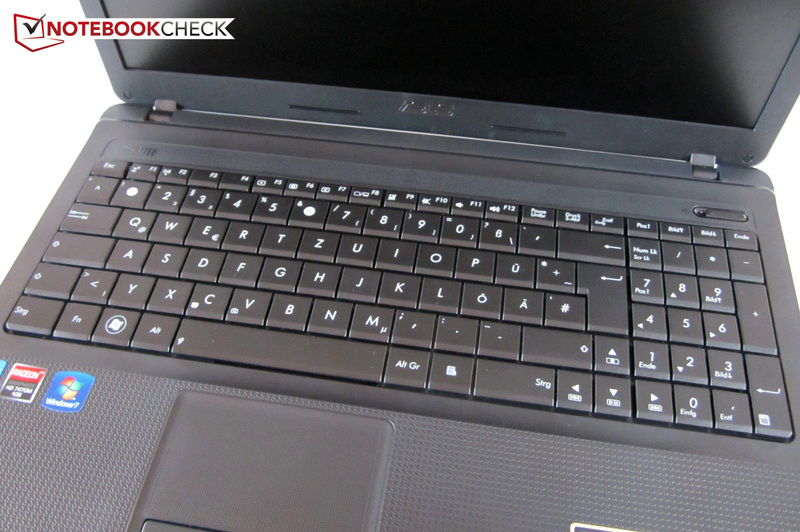 In contrast to other models, Asus doesn't use a chiclet design. 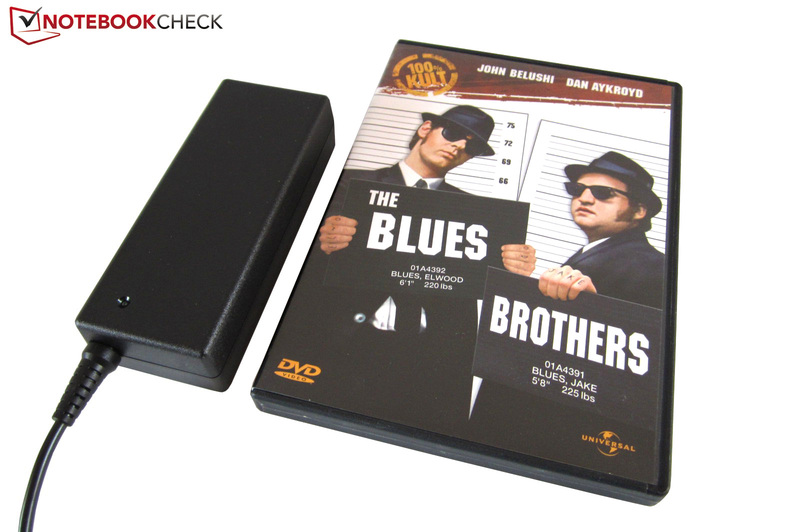 The notebook is touted to have a cool wrist rest. 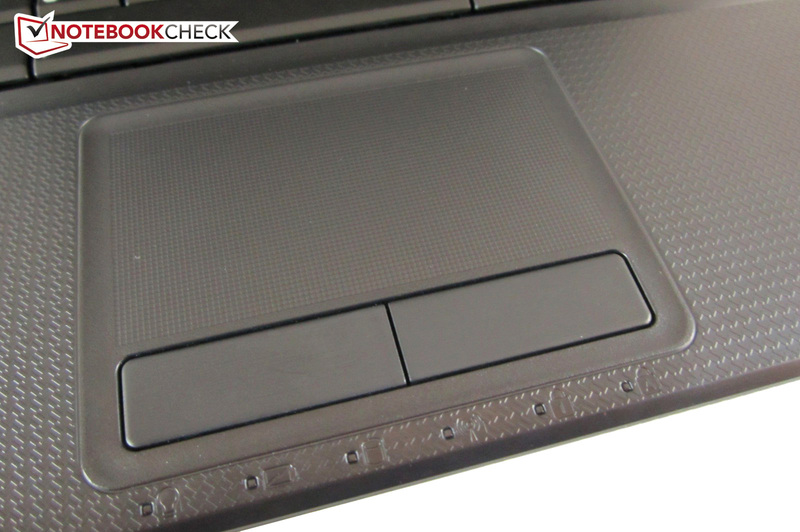 The roughened touchpad surface is a matter of taste. Audio jacks and the card reader are hidden on the case's front. The notebook only has two USB ports. A CD/DVD burner is installed as the drive. A few more ports would have been very welcomed. 320 GB are fairly scanty nowadays. The battery has to live with four cells. Unusual: Acer only installs one RAM slot. The black surfaces make a quite simple impression. The lid and wrist rest are patterned. The matt screen hardly reflects. The multimedia device isn't particularly heavy with a weight of 2.4 kilograms. The maximum opening angle (~150°) is above average. You shouldn't have very high expectations on quality. Fingerprints aren't a big issue on the X54HR. As usual, the manufacturer's logo adorns the lid. There aren't any lighting elements. 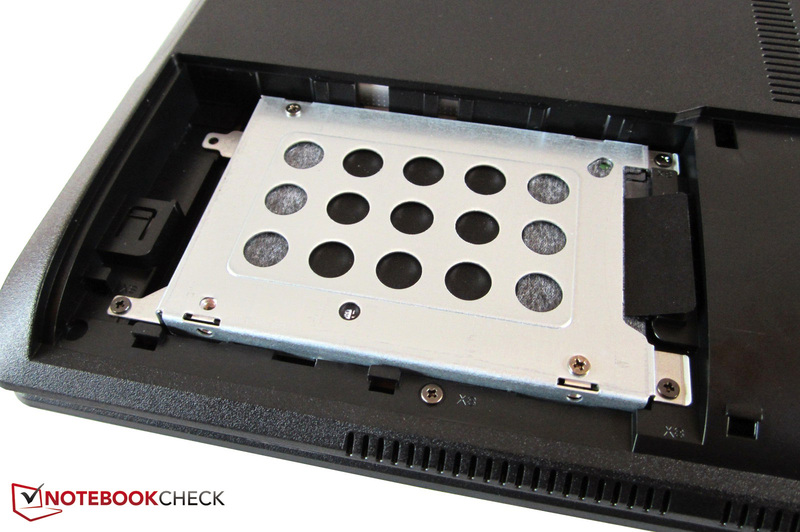 Almost all ports are placed on the case's front half. The notebook can't serve with many interfaces. Two screws keep the cover on the bottom in place. The power adapter is very handy. The lack of sensitive high-gloss surfaces. A longer battery life and a better connectivity (more USB ports!). That Asus opted for a matt screen. 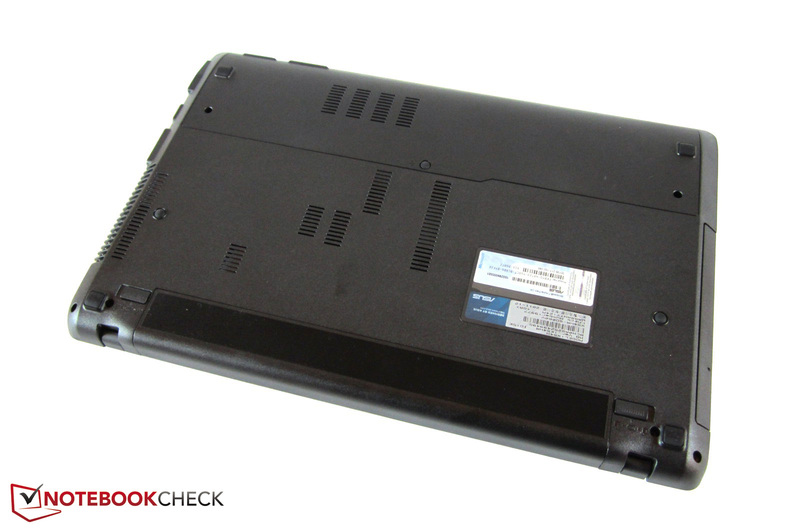 Multimedia notebooks for less than EUR 500, such as the Acer Aspire 5750G-2354G50Mnkk (15") or the HP Pavilion g6-1352eg (15").